Purchase to download and obtain a license. Subscribers are not getting added to my privileged group. 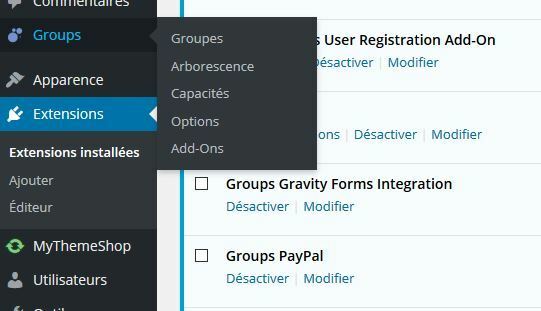 I have setup Sandbox Mode in Groups Paypal. When logged into the Paypal sandbox I check the Notifications and can see that transactions are going through. When logged in as WordPress admin, I can see those same transactions appearing as subscriptions. But when I check the Users section, the subscriber has not been added to the privileged group. Is it supposed to work in Sandbox Mode? 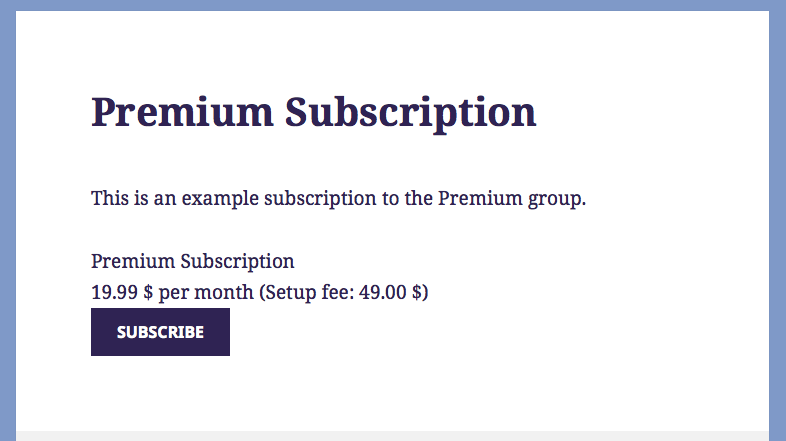 This seems correct except that you might not have assigned any group(s) to the subscription. I would recommend to check that as mentioned on http://docs.itthinx.com/document/groups-paypal/adding-subscriptions/ – if that’s not it, then please post a support topic on https://www.itthinx.com/forum/groups-paypal/ for our team to help you further. Thanks for reply. The subscribers are being added correctly now. The change I made was to login as a paypal seller (example-facilitator at gmail dot com) to the sandbox and update the business profile. Thanks Gavin, that sounds correct. Great to hear that you have it working now and thanks for using our tools! There is a link *installation instructions*. It takes me to an installation page. But it’s about Affiliates. I was expecting to see some instructions about Paypal? 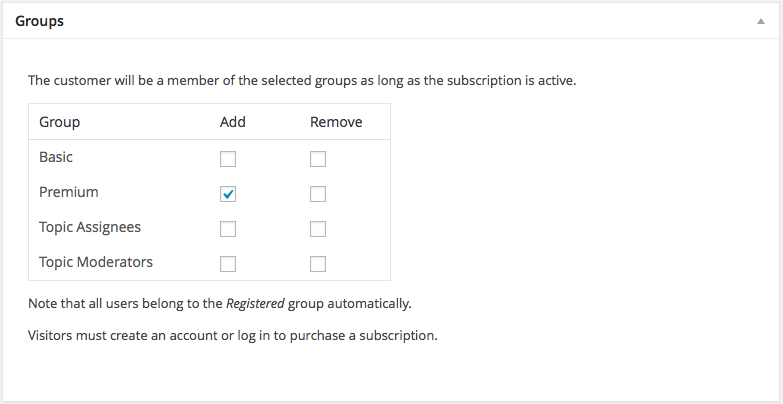 please be sure you have installed and activated the Groups Subscriptions plugin. I recognise that some of these plugins are not managed by yourselves, just wanted to know if this was possible in practice. if you use Groups for Woocommerce and Woocommerce Subscriptions, Groups communicates with Woocommerce, so it doesn’t depend of the gateway. So you could use the three plugins together. i use groups paypal to handle subscriptions, but i am increasingly finding customers who have issues with Paypal and require a different gateway. i see in the comments here that stripe is referred to, but i cant find a “groups stripe”. is there an equivalent stripe plugin? or am i looking for the wrong thing. sorry, right now there isn’t an integration with Stripe. I already paid and installed paypal for groups. 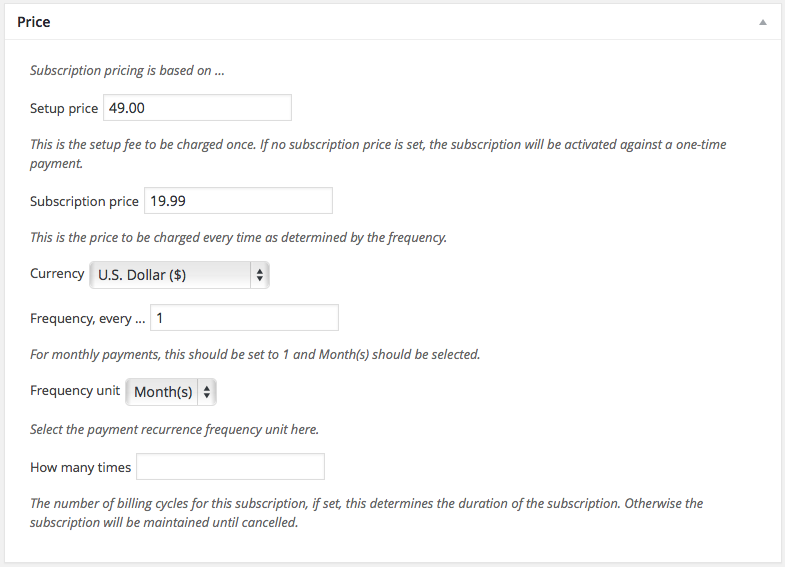 Configured the plugin and added the subscriptions. The members of the page see the subscription amount, do the subscription, log into paypal, pay it, but they are never added to the correspondent group. please, about support questions submit a new topic in the forums. Much of the code above is actually my stuff for retrieving the group and capability names from the Formidable form fields. The key take aways are to use the ‘frm_payment_paypal_ipn’ hook and the ‘Groups_Group_Capability::create()’ call to add the capability corresponding to the purchase to the group, thus unlocking associated protected content. And I already made a five star review of your plugin last year, I for sure confirm that review! Thank you very much for sharing your solution, I’ve moved the code to this Gist for reference. I’m sure this will be helpful for others, great work! Also many thanks for your kind review from last year, I’ve just read it 🙂 If you have any suggestions for Groups at any time, please feel free to let me know. Thanks a lot for the quick answer 🙂 Actually when a purchase is done, I don’t want the user to be added to a group. I just need a given capability to be added to a given group, thus giving access to some content to the user (and to all other users sharing the same group) a drip content way. So it seems that Groups Paypal is maybe not the best solution for that, since it automatically does a lot of things that I don’t need and don’t want in this case. However, since I use Formidable Pro forms, I could use instead the Formidable Paypal add-on and simply program the capability-group pairing when successfully returning from payment, using after payment hooks. So I think I’ll do that unless you see an even better and simpler solution with Groups Paypal. Many thanks anyway for your answer and for all your great work with your fantastic Groups plugins! Have you tried your solution with Formidable? If the capabilities are needed for your setup to work, then it could be a good solution. If you’d like to share how you have done it, it might be interesting for others, too. 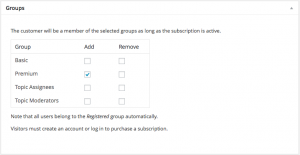 When a user buy a given subscription, I need to add a new capability to an already existing group. Is there a way to achieve this programmatically? I mean, not through shortcodes but php calls? Would that work or do you need to restrict it to an event related to the subscription? I saw some early talk back in 2012 about using adaptive payments. Is does this work with Paypal chained payments? Is there a way that users can setup groups and charge with the payments being split between the user and the host? Thanks for asking, no this isn’t available with the plugin, sorry. I use a different third party payment gateway which sends POST notifications to a URL on my WordPress. I am making a system which will assign users into groups from these subscription payment notifications. Would you recommend modifying this plugin to make use of it’s subscription tracking capabilities? Easier than starting from scratch at least? Cybersource Secure Acceptance (http://apps.cybersource.com/library/documentation/dev_guides/Secure_Acceptance_SOP/html/wwhelp/wwhimpl/js/html/wwhelp.htm). 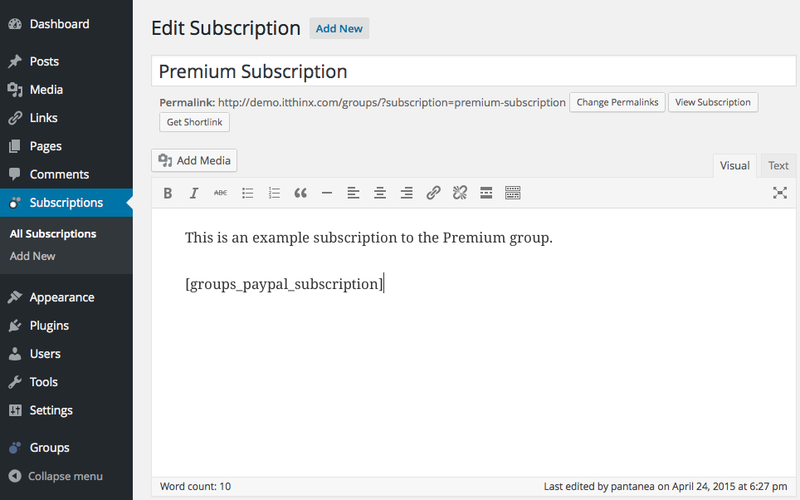 I could write the code to tie it to Groups Subscriptions, but it would be good to get your take before I start. I would buy Groups PayPal as an example. For that, I’d be happy to provide the plugin to you without the need to purchase a license. subscribers on the same day to make sure we receive payment before the boxes are shipped out. Since you do not offer trial periods for subscriptions, is there something I can do to work around that and put all subscribers on a 1st of the month payment schedule? I know there’s probably nothing we can do to change our current subscribers payment schedule, but please let me know if you have any suggestions. Would a trial period really work with what you’re selling? I mean if you ship a box monthly, would you send out boxes for free? Or would you just offer a discount to new customers? In any case, I imagine the motivation to have a fixed payment day would be to make sure that all monthly payments have been received before you ship out to all customers? Yes, we would like all of our subscribers to be billed on the 1st of every month so we can make sure everyone has paid by the time we ship boxes out on the 15th. Any suggestions? Hm … for example, let’s say I join on the 12th. As I join, I make my first payment so I would appear as a valid subscriber and should receive my box that you send out on the 15th. If I join after the 15th, I would not be entitled to the box that has already been sent out that month, but to the one next month. I think you don’t actually need to get the payments in exactly on the 1st? I understand what you’re saying, but we need everyone on the 1st of the month. Will this be possible in an update soon? What you suggested just will not work with our business model. Thanks! I’m not sure this would even be possible based on how subscriptions work with PayPal – see for example this thread and this question. Ok. Do you know of another payment processor that would work better for us? We’ve heard possibly Authorize.net? Thanks again for your suggestions/help! Does this plugin support Trial periods for subscriptions. If not is there a way to use paypal subscription button? As it is right now not, the only option that would come close is to offer a reduced subscription which assigns to groups for a limited amount of time. Hi, I was wondering if it is possible to use discount coupons? now does not support the use of discounts coupons. Well actually it can support discounts, but it depends on what criteria are used to decide whether a discount should be made available or not. For example, you can create a version with a lower price and make it available conditionally based on group membership. Would you add other payment checkouts, like google checkout. Or maybe a module for other payments. Yes, Stripe and PayPal Pro are also going to be available. Looks rough – I know but I can not get this plugin to work… I see the subscribe button – login and everything disappears upon next load. Is an SSL required to run this plugin? 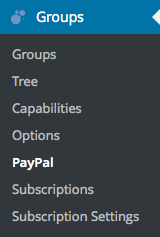 Have you configured the settings in Groups > PayPal correctly? The Checkout button isn’t rendered so either there is something missing in the setup or there might be a conflict. Can we have a look at the admin? I purchased Affiliates Enterprise as well as Groups Paypal because I’m hoping to use affiliates enterprise with paypal integration along with groups paypal to make an overall solution to being able to have affiliates sell subscriptions to my membership site. I started hooking everything up though and it seems that these are mutually exclusive since they have differing IPN requirements. Did I miss something in the documentation? Groups-Paypal says to set it to groups-paypal/lib/ipn.php and Affiliates Paypal says to set it to the affiliates page (I think) either way, I think they’re different. They can be used together but we need to ‘communicate’ them, can you please contact me here? Hi, I have a pre-purchase question. I am selling to registered members a subscription that allows them to add a custom post-type for advertising their services. I think I can see how this is done with your plugins, my question concerns being able to offer either a choice of fees when subscribing or a to be able to fill in a fee that they choose. I know this sounds unusual but this site is very international and I want the fee paid to be representative of the local economy and personal circumstances . Its sort of a ‘donation’ but not really. I hope this makes some kind of sense. The groups plugin is an absolute god send for what I am trying to do, so thanks for developing it. 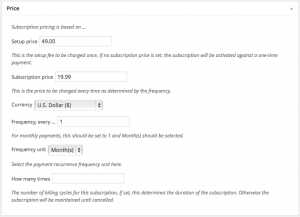 As the prices are set for each subscription a payment option where the buyer can choose the amount as with a donation button can’t be done directly. One solution would be to offer several choices which grant access to the same groups. Of course another option would be to just place a donation button on the page where people can join a group, you wouldn’t need this plugin to achieve it, just the usual PayPal donation button and using the short codes that Groups provides. I hope that somehow helps, if you want to use the first option I think a good idea would be to offer something in addition when people pay a higher amount. 1. How can I use my own buttons to “subscribe” instead of using a shortcode? Or at least a shortcode that shows only the button. I have a pricing table with a “Sign Up” button on the bottom of each subscription level. 2. 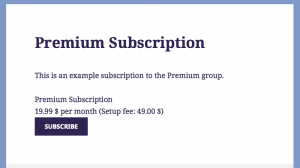 When I create a subscription, I’m not able to change the page template. I’m stuck using a blog template. If you want to see exactly what I’m working with, go to: http://omnoogle.com/peek and click on “Google AdWords Pricing” under “Packages & Pricing”. These two issues are keeping me from using this plugin at all. I’m disappointed that I just spend fifty bucks for a plugin that has no flexibility. You can do both, for #1 have a look at the shortcode’s attributes on the plugin’s documentation page (at the end of the page) – for #2 you can place the shortcode pretty much everywhere, you just indicate the id of the subscription (this is also documented on that page). This is great news! Do you have an estimated release date? This Year? This winter? Early 2013? For PayPal Pro it should be this year, others following shortly including Stripe. This, along with your groups plugin, makes for a perfect solution for my multisite! However, (I’m sure this gets requested a lot) are there no other payment processing options besides PayPal Standard? I want to integrate my merchant account with this, but I would need at least PayPal Pro to do so (preferable Authorize.net). Are you planning on adding more payment processing options in the very near future? I wold buy this plugin without a second thought if it had Authorize.net integration!